Background Despite 3 randomized trials of postop radiotherapy (PRT) controversy exists in its application. Methods Retrospective analysis of the experience in PRT from a single center. Various variables were analyzed; , distribution by clinical stage, Gleason (GLE) and PSA diagnosis. Postoperative Gleason / characteristics of the pathological stage. Also the indication for PRT (adjuvant PSA <0.2 ng / ml, early salvage < 0.3 after PSA rise from 0.0 and salvage PSA PR of> 0.3 ng / ml) and Grade (G) of chronic toxicity 3-4 (EORTC) and number of metastases (M1) . The cause of death was analyzed (by CP or no, disease-free survival (DFS), cause-specific survival ( CSS), and overall (OS) in relation to PRT intention, compared with a Log Rank test. 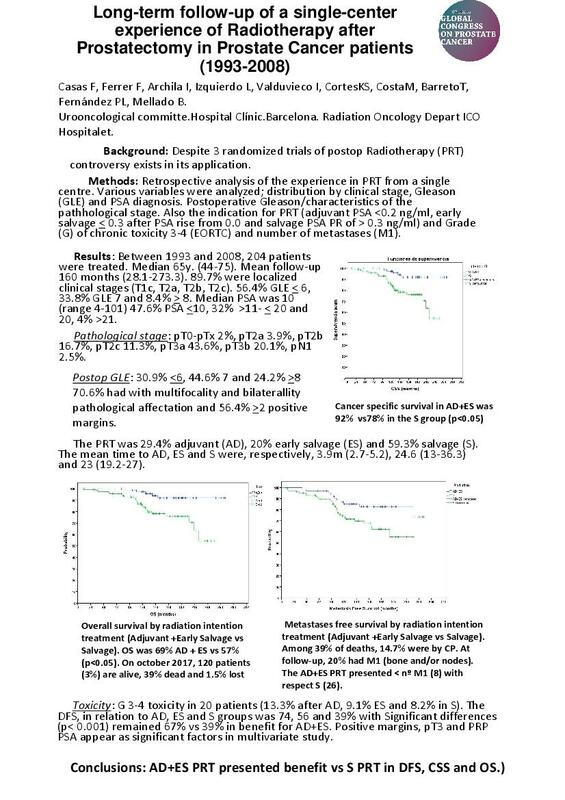 We also present a multivariate study on prognostic pathologic factors and PRT sort with survival.Results Between 1993 and 2008, 204 patients were treated. Median 65 y. (44-75). Mean follow-up 160 months (28.1 - 273.3). 89.7% were localized clinical stages (T1c, T2a, T2b, T2c). 56.4% GLE < 6, 33.8% GLE 7 and 8.4% > 8. Median PSA was 10 (range 4-101) 47.6% PSA < 10, 32%, > 11- <20 and 20, 4% > 21. Pathological stage: pT0-Tx 2%, pT2a 3.9%, pT2b 16.7%, pT2c 11.3%, pT3a 43.6%, pT3b 20.1%, pN1 2.5%. Postop GLE 30.9% < 6, 44.6% 7 and 24.2% > 8. 70.6% had with multifocality and bilaterallity pathological affectation and 56.4% > 2 positive margins. The PRT was 29.4% adjuvant (AD), 20% early salvage (ES) and 59.3% salvage (S). The mean time to AD, ES and S were, respectively, 3.9 m (2.7-5.2), 24.6 (13-36.3) and 23 (19.2-27). Toxicity G 3-4 toxicity in 20 patients (13.3% after AD, 9.1% ES and 8.2% in S). The DFS, in relation to AD, ES and S groups was 74, 56 and 39% with significant differences (p <0.001). The AD + ES groups was aggregated versus S group; for the DFS, the significant differences (p <0.001) remained 67% versus 39% in benefit for AD+ES. Positive margins, pT3 and pre PRP PSA appear as significant factors in the multivariate study. The CSS in the AD + ES group was 92% versus 78% in the S group (p<0.05). OS was 69% AD + ES vs. S 57% (p<0.05). On October 2017, 59, 3% are alive (120), 39% dead and 1.5% lost. Among 39% of deaths, 14.7% were by CP. At follow-up, 20% had M1 (bone and / or nodes). The AD+ES presented < nºr M1 (8) with respect to S (26). Conclusions AD + ES PRT presented benefit vs S PRT in DFS, CSS and OS. A few results coincide with randomized studies (higher DFS and lower number of M1).